San Miguel’s recent purchase with purchase promotion was seen at convenience stores around Hong K ong. 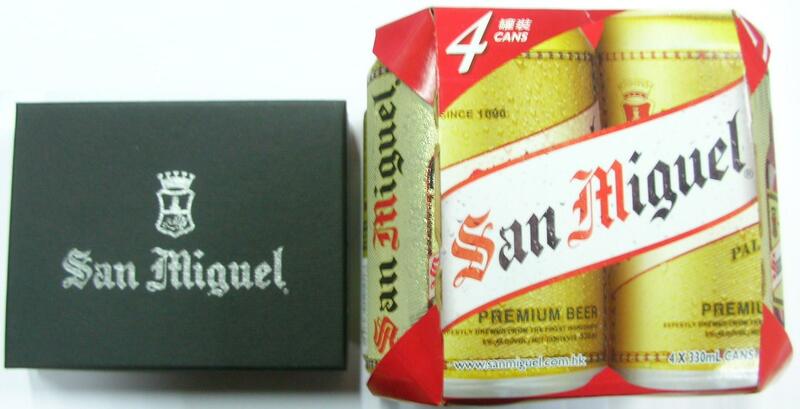 With every pack (4 Cans, 330ml) of San Miguel Beer purchased at HKD$24 (USD$3.1), you are entitled to purchase a limited edition men’s wallet at HKD$28 (USD$3.61). An interesting beer promotion as the pricing of the promotional product is more expensive than the beer itself. Packaging of the wallet is in a black cardboard box with silver print. Inside, the wallet is packed in an OPP bag with a San Miguel’s logo sticker; overall enhancing the perceived value of the wallet. A simple, neat faux leather wallet with red sewing all around. Branding is done on the inside with embossing of their logo -Practical yet stylish promotional product for men. For more ideas on beer promotional products, do visit our BeerPromos website.